We all get our medieval history from somewhere. We fall in love with a place or a time and we collect stories about it or have crushes on famous dead people or learn about a town or a bridge. Every now and again a writer comes along who looks at the stories most people tell about the Middle Ages and says, “I can have fun with these stories.” Once in a generation, a writer comes along and, in making fun of his generation and in creating fun using the Middle Ages brings together a new set of stories for people to tell. This is what Mark Twain did in 1889. I’ve been told so my times how accurate the history in A Connecticut Yankee is. In a way, the people telling me it’s accurate are right. It’s a perfectly exact depiction of a way in which many people see the Middle Ages. Most such depictions get caught in time, the way so many dishes were caught in aspic in 1970s cooking. Their preservation allows us to examine from many directions. Like food in aspic, some will find the depiction of the Middle Ages delightful and forever-refreshing, some will find it classic, some will find it annoying, and others will react in other ways – but its continued publication means that those different directions are possible. This is one way in which Mark Twain’s work travels through time. It remains in print and different people read it in their various ways. When they read it, they react, and Twain’s work travels in a quite different manner. So many movies have been inspired by the book, so many modern versions (including one where a fashionista travels backwards) so much story that began when the first person read Twain’s version. This is, to me, what makes a classic. A classic for me is a story that takes earlier culture and does exciting things with it. It sits in its own period and place and reflects on its own time. It then does the same for other time periods as it passes through them (preserved in its aspic-equivalent), getting older and older. We as readers have to travel back in time to reach it and we have to research a little to understand the language and the meaning. The Dream of the Rood is no less exquisite for this: it occupies a different place in our cultural history. The trick with works that can cross time is that we translate them in our mind, Even if they’re in modern English, we read them from the present rather than travelling back to the time of Twain and reading from Twain’s perspective. This is how we know the Middle Ages from classic fiction. We see the Middle Ages as written by Twain, where his robust an opinionated and somewhat unethical jack-of-all-trade changes the society he encounters into a variety of Colonial America. There are so many things to say about what this book says about the Middle Ages and, in the saying, what this book also says about the USA of 1889. I might come back to some of those another time. We’ll see. What I’m curious about today is that time travel aspect, or, to prolong a bad joke past anyone’ comfort level, the aspic that keeps the story alive for readers beyond a generation. The fact that it’s not just the person who time travels, but the reader. I’m fascinated by the limitations of our capacity to travel back in time using fiction, in other words. We can feel we’re in the past and the author can do an amazing job at bringing together current knowledge (or, in Twain’s case, current popular knowledge) to make that feeling personal and real. The past itself is gone, but a really good novel gives us that feeling of it being within our grasp, and, at the same time, it changes what we know about the Middle Ages and how we see it when we close the book with a sigh. This is meat and drink to me, for I started life as an historiographer. The dynamic of this book transforming our views of Camelot and carrying it through time is a magic one for me. Next time I’ll talk about a book that does this quite intentionally and that pretends it’s not a novel, just like A Connecticut Yankee with its “This traveller told me this” fiction. Twain’s work is acerbic comedy with all the good and so much of the uncomfortable in our stories about the Middle Ages and about the USA. Top Image: Frontispiece in: A Connecticut Yankee in King Arthur’s Court / Samuel Clemens. New York : Charles L. Webster & Co., 1889. 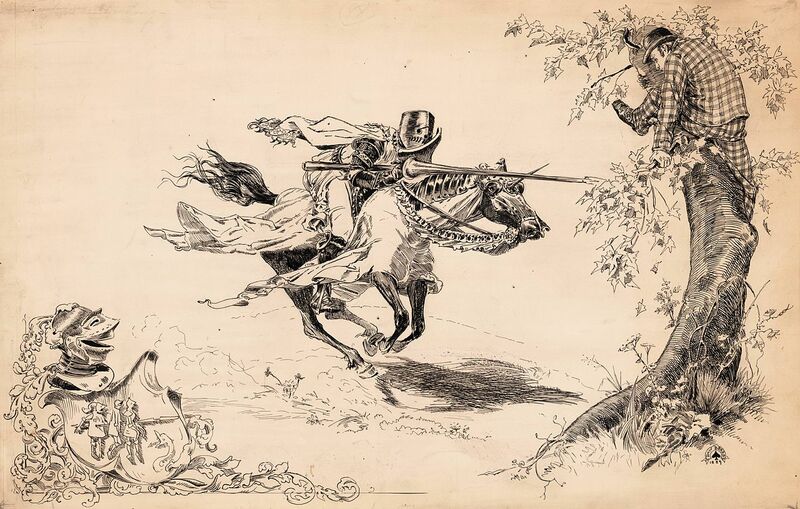 Knight in armor tilting at man in modern dress in tree onto which a man in modern dress has climbed for refuge.